My life, like so many others, can be very hectic at times. For starters, I am the mother of two kids with another one on the way. Every day there are errands to complete, the house to keep up with, doctor appointments, blogging and more. It is no wonder at times I will crash and forget to tend to my face regularly like I should. I do clean my face every night, it's just that sometimes it is hard to find the time to really exfoliate my face the way I used to. When I had the chance to work with Simone France on a product review on the Instant Radiance, I was thrilled. I had read so many nice things about their products and was really impressed with the reputation that they have built with their customers. So why not get back into a routine of doing more then just cleaning the makeup off my face? With Simone France, this is now a possibility. When you use this product you will want to wash your face and get all of your makeup off first. Then apply to your neck and your face. Once the mask is dry, you simply peel or wash off with a warm wash cloth. Then you are all done. You can use this product up to 3 -4 times a week. I really love how smooth and healthy my face feels after using this product. I try to use this product at least 3 times a week. I know if I push for four, I just could not find the time. The results have been amazing. My face feels smooth, my skin is tight, feels & looks healthy, and has a glow to it. I have not had any breakouts, redness, blotches, or rashes due to the mask. I really like how well my makeup goes on not too. It looks much more smooth and natural looking. 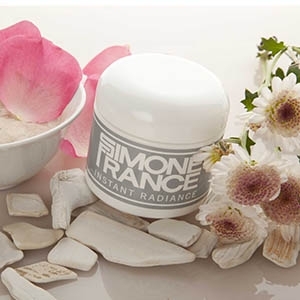 About the company: Simone France is the renowned French-born skin care expert whose healing hands and top-of-the-line products have cared for some of the world's most beautiful faces. You can show some love by liking Simone France on Facebook and on Twitter. Where to purchase: You are able to make a purchase from the Simone France website. I'd love to try the "Handwich"
I'd love to try Eye Candy!